Embrace all the newest features and latest technology - including calling, texting, plus amazing no-contract Wireless Plans on the Prepaid Alcatel Smartphones. Reviews, Promotions, and Deals on Cell Phones from Verizon, FreedomPop, Net 10, Simple Mobile, Sprint, Straight Talk, Tello, TracFone, Q Link. Great smartphones from the hottest brands with low monthly pricing available. Order a phone from Simple Mobile and enjoy up to 40% Off on the purchase + Free Standard Shipping. Use code SM40OFF while making your order. Exp. July 31, 2018. Simple Mobile introduces one great deal a day featuring big savings! Click here to sign up today to be the first to shop some of the best deals of the day. Simple Mobile: Free Standard Shipping on all orders. Order your next cell phone or SIM Card from Simple Mobile and enjoy Free Shipping on all orders! Exp. Mar 27, 2019. Alcatel OneTouch Pixi Avion A570BL is a 4.5-inch smartphone that comes running Android 5.1 Lollipop. As you will discover in this review, Android Lollipop is a pretty modern OS version that has some cool features. The Pixi Avion is also 4G LTE and has a quad-core processor, so you are sure of better speeds. The Alcatel OneTouch Pixi Avion A570BL is a CDMA phone that activates on the Verizon network. So, before making an order, be sure to check that you have Verizon cell towers/coverage in your home area. There's also Alcatel OneTouch Pixi Avion A571VL which is the GSM variant that works with the AT&T network. The only difference between the two gadgets is the naming and the network technology; other features remain the same. So, whether you are on AT&T or Verizon coverage, this phone will serve you. So, let's continue with the review. The Alcatel OneTouch Pixi Avion A570BL is a prepaid smartphone available from the Straight Talk Website. In the purchase box, you will find the phone, battery, wall adapter with a fixed microUSB for charging, activation card, services guide and a quick start guide. Apart from a very long name: "Alcatel OneTouch Pixi Avion A570BL," nothing is out of the ordinary on this gadget. It comes with a typical Alcatel exterior layout. We have the 4.5-inch display sitting on the front of the device. The upper part of the screen hosts the front camera, the earpiece, and a LED indicator. The cryptic navigation keys sit on the lower part of the display. These are not the floating navigation buttons as you would expect in an Android Lollipop device. Nevertheless, they serve the purpose well. Their arrangement is such that; the back button is on the left, the home button at the center, and the recent apps button on the right. Moving on to the frame layout, we have the power button and volume rockers on the right edge while no buttons whatsoever on the left edge. On the top edge, you have your headphone jack. The bottom edge has a micro-USB/charger connector. The black cover has a typical flat layout. The upper part of the cover is your rear camera while on the lower part sits your hands-free speaker. When you remove the back cover, you will access the battery compartment as well as the SIM and microSD slots. The Alcatel OneTouch Pixi Avion A570BL being on the lowest end of gadgets, the camera doesn't hold great features. The back camera is 2MP and a 0.3MP front camera. Since there's no LED flash, the camera performs well in good lighting only. Despite being short on pixels, the cameras can take videos and shoot quite nice photos. The cameras also have several modes such as auto mode, HDR, and Pano. You can also adjust settings and turn geotag or set geotags. The Alcatel OneTouch Pixi Avion A570BL has a 4.5-inch display with a resolution of 854 x 480 pixels. The screen is perfect for one-handed operation, and still large enough that you will enjoy watching videos on it. Indoor brightness is great. As expected from a phone in this price range, outdoor screen brightness is not that great, especially in direct sunlight. Alcatel OneTouch Pixi Avion A570BL ships with a robust battery life that will give a full day of typical usage. The screen is not that big to put much strain on the 1780mAh battery it comes with. 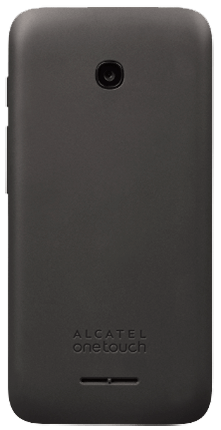 The battery can hold up to 5 hours of talk time and 7.5 days standby. If you just need a phone to keep you connected; be available for calls, texts, and for checking emails, the battery will last a day. For super users who need a gaming device or constant video streaming; such intensive processes drain the battery faster, so the Pixi Avion will give you about 5 hours of usage. Despite other features being limited, Alcatel OneTouch Pixi Avion A570BL performs well when it comes to storage. Onboard is 8GB of internal storage with 4.4GB available for your use. This is a nice and definitely a selling point because most phones within this price range come with less than 2GB of storage. Additionally, the phone supports an external microSD card of up to 32GB which gives you even more storage capacity. Alcatel OneTouch Pixi Avion A570BL comes with Android 5.1 Lollipop which supports thousands of apps on Play Store. Given the resources packed into this device, the performance is above average. There's a Qualcomm Snapdragon 1.1GHz quad-core processor onboard, and it's paired with 1GB of RAM. With Android Lollipop running on top of these resources, you get better multitasking experience, fluid animations while you navigate through different screens or switch between apps, and freezing is at the minimum. The phone can have several apps running in the background, and you can easily switch between them using the recent apps button. One other thing I like about the Alcatel OneTouch Pixi Avion A570BL is the 4G LTE capabilities. Browsing speeds are incredibly fast, and I noticed no buffering on YouTube video streaming, Google Maps loads faster. Apart from fluid animations and better User experience that comes with Android Lollipop, you get to enjoy other fancy features like 'Google Now.' This feature allows you to search from any screen of the phone by using your voice. No typing involved! Personally, I found this enjoyable, and particularly as it loads very fast thanks to the 4G LTE capability. 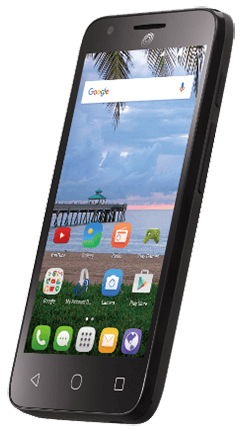 Some other standard features of the Alcatel OneTouch Pixi Avion A570BL include Bluetooth 4.1 for quick sharing of files between nearby devices, Wi-Fi for connecting to public hotspots to enjoy free internet, GPS for location services and navigation, and Hearing Aid Compatibility. Internal Memory 8GB. Supports a microSD card of up to 32GB. 2 MP back camera. 0.3MP front camera. Battery capacity: 1780mAh. Talk time up to 5 hours. Standby time up to 7 days. Dimensions: 5.2''(Height) x 2.56''(Width) x 0.4''(Depth) inches. $23.75 monthly with auto re-up; Unlimited Nationwide Calling and Texting. Unlimited International Texting. Unlimited International Calling to mobiles in Mexico, Canada, India, China, and 16 more countries (up to 15 unique numbers). Unlimited Data (1GB Data at High Speeds, balance on lower speeds). Mobile Hotspot Capable. No Contract. No Credit Check. $28.50 monthly with auto re-up; Unlimited Nationwide Calling and Texting. Unlimited International Texting. Unlimited International Calling to mobiles in Mexico, Canada, India, China, and 16 more countries (up to 15 unique numbers). Unlimited Data (2GB Data at High Speeds, balance on lower speeds). Mobile Hotspot Capable. No Contract. No Credit Check. $37.50 monthly with auto re-up; Unlimited Nationwide Calling and Texting. Unlimited International Texting. Unlimited International Calling to mobiles in Mexico, Canada, India, China, and 16 more countries (up to 15 unique numbers). Unlimited Data (6GB Data at High Speeds, balance on lower speeds). Mobile Hotspot Capable. No Contract. No Credit Check. $45 monthly with auto re-up; Unlimited Nationwide Calling and Texting. Unlimited International Texting. Unlimited International Calling to mobiles in Mexico, Canada, India, China, and 16 more countries (up to 15 unique numbers). Unlimited Data at high speeds. No Contract. No Credit Check. $57 monthly with auto re-up; Unlimited Nationwide Calling and Texting. Unlimited International Texting. Unlimited International Calling to mobiles in Mexico, Canada, India, China, and 16 more countries (up to 15 unique numbers). Unlimited Data at high speeds (Includes 10GB mobile hotspot). No Contract. No Credit Check.